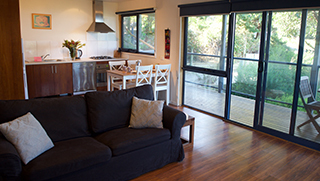 Fisheye9 | Great Ocean Road accommodation for families and pets. Great accommodation that is wheelchair accessible. Located on the spectacular Great Ocean Road. 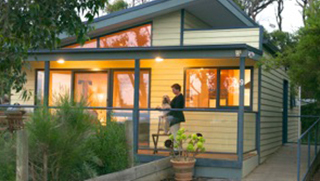 Wheel chair accessible and pet friendly accommodation located on the spectacular Great Ocean Road. Fisheye9 is a unique two bedroom cottage located along the stunning Great Ocean Road in Victoria, Australia. With magnificent ocean views, natural surroundings and a modern, spacious interior, this well-presented accommodation site is suitable for families and people with pets, and also perfect for those needing accessible facilities, having been purpose built with disabled and wheelchair access in mind. 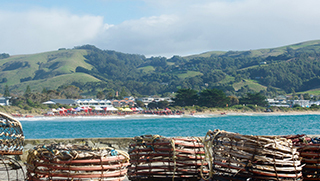 It is a fabulous place for a summer holiday by the beach or a cosy winter getaway by the fire, and is situated just 5 kilometres from the beautiful, coastal town of Apollo Bay, which offers shopping, farmers markets, gallery, cinema, and a selection of restaurants and cafes. Fisheye9 is your home away from home, and ever so comfortable! Featuring full kitchen facilities, spacious bedrooms, cosy lounge with gas log fireplace and an undercover deck with barbeque facilities. Fisheye9 is situated in the small town of Skenes Creek, known for its direct beachfront access, and is only 5 kilometres away from Apollo Bay – a beautiful coastal town surrounded by the Otway Ranges. Owners Stephan and Tanja are very welcoming and friendly, and making you feel comfortable is what they’re most good at! With personalised service and easy, direct ways to reserve Fisheye9, why hesitate? Book now. Our guests love it. So will you. A quality testimonial from our very happy guests! It was an absolute pleasure to stay here. It was truly a home away from home. There was nothing we could think of that was not already provided. Truly 5 star place to stay. There is no doubt we will be back to have this experience with other friends and family. Not much more to say but thank you for letting us into your home. © 2018 Fisheye9. All rights reserved. A Studio Manta project.